You are probably familiar with the work of James Joyce. It’s less likely that you are familiar with his only known play, Exiles. 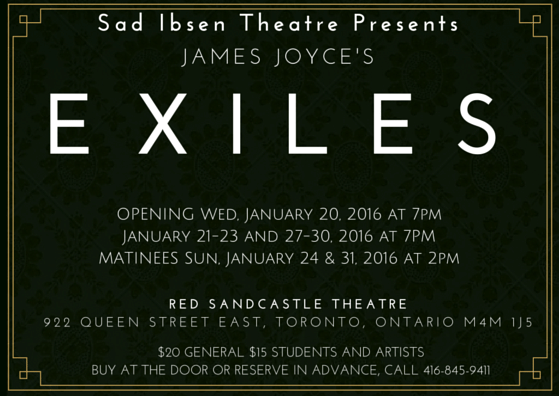 So if you are a Joyce fan, now is your chance to see this lesser-known work playing at the Red Sandcastle Theatre on Queen East, directed by Ryan Borochovitz. It makes sense that a company named ‘Sad Ibsen Theatre’ would be producing this play. Ibsen was an early influence in the young Joyce, and Exiles was inspired by Ibsen’s play When We Dead Awaken, also about a middle-aged artist, exploring the themes of guilt and freedom. Of course, Joyce’s play goes in a different direction from that of Ibsen. And, despite having been written nearly a century ago, it deals with guilt and freedom in a way that might strike the audience as particularly relevant today: the Rowans have something of an open relationship. Richard says explicitly that he will not stand in between his wife, Bertha, and any love interest of hers. In this case, said love interest takes the form of Richard’s old friend Robert Hand. Meanwhile, Richard has obvious affections for Beatrice, his cousin and muse. Richard is wracked with guilt over his fraught relationship with his (now deceased) mother, and his marital infidelities. He claims he doesn’t have the right to own anyone, to possess them for himself, to make them obligated to him. For Richard, liberty is opposed to possession and obligation. He encourages Bertha in her tryst with Robert, but insists that everything be open and honest. But Richard’s drive to radical honesty seems to be masking his actual intentions. This is not a man who is radically liberated, this is a man who is wracked by his own guilt and inability to give his loyalty or affection to a single person. He’s also full of contradictions. He says that he wants Bertha to be free, but then he wants to know every detail. Why? Because he has some kind of cuckold fetish? Well, maybe. I suspect it might be more banal than that, that it might be just that even in his alleged liberation of his wife, he still wants control. And he gets that the way that an intellectual artist would: through knowledge. He wants to know everything, he wants to hear every detail, and he wants everyone to know that he knows everything. This isn’t about integrity, or freedom. This is about controlling his feelings, controlling his reputation, and controlling his wife. George Kiriakopulos plays a very self-serious Richard, at times a bit too stiffly (he kind of hit one note for the whole production) but in a way that is nevertheless consistent with the character. Benjamin Diamond Coles is an excellent contrast as Robert Hand, who is warm and awkward, a charmer and joker, lusting after Bertha and trying to reconnect with Richard. Tiffani Anderson-Davies, as Bertha, has to carry a lot of the play, and her nuanced performance is one of the reasons this play is so easy to watch. She enjoys Robert’s attention, while also trying (unsuccessfully) to make Richard jealous. Finally, in her liberty, Bertha does the one thing that Richard tries to subvert: she devotes herself to him. Her freedom allows her to do the one thing that Richard is entirely unable to do, and we see him collapse under the weight of that in the final scene of the play. The Red Sandbox Theatre is an intimate if slightly drafty space, which is entirely appropriate for this show. The play is also peppered with comedic characters, and, despite the length (three hours) was surprisingly easy to watch. The acting, while being a bit spotty and at times including inconsistent and inaccurate Irish accents (seriously, just don’t do the accent if you can’t do the accent) was mostly solid. Adriana DeAngelis punctuates the action nicely as Brigid the housemaid; Ashley Stevens stands out as the cagey Beatrice Justice; Tara Shell, as the Rowans’ son Archie, also provides a nice contrast in tone and character. Overall, despite the various flaws, the production is charming and worth checking out. My Theatre Award Nominee: Adriano Sobretodo Jr.